Edel Assanti is pleased to present 'The Solar cry', a solo exhibition of new work by Gordon Cheung. Drawing on intertextual sources from the classical to science fiction, Gordon Cheung's multi-media practice seeks to establish a sign-system to visually capture the virtual landscape in which 21st century man exists. The themes of these layered works continuously evolve to reflect ecological, social and political reality in globalized capitalist society. The Solar Cry draws inspiration from Bataille's famous essay, 'The Rotten Sun'. the text describes the Mithraic cult, who practice sacrificial worship of the sun by slashing the throat of a bull, venerated as the earthly symbol of the sun-god. The exhibition centres around four epic landscape paintings depicting the bull-rider - Cheung's adaptation of classical Minotaur mythology - within the art historical context of the romantic sublime landscape, aligning himself with the painters of the genre, Caspar David Friedrich and John Martin. Cheung's prophetic visions of the impending collapse of modern civilization are set against the collaged stock listings of the Financial Times, creating a backdrop of raw information, an aesthetic phenomenon which the artist terms the 'techno-sublime'. the surface of the paintings is carefully rendered, layering digital printing, ink, acrylic paint and, in an unprecedented sculptural approach, papier maché Financial Times and pigment made from the ashes of burnt newspaper. The imagery is harvested from the artist's archive of found internet and media material, forged together to create a hyper-real cyberspace of crumbling cityscapes, paranoiac hallucinations and mythological apparitions. Cheung's artistic vocabulary draws upon his dual fascination with the pseudo-deist personification of the financial market in contemporary parlance, and the animistic signs of the bull and bear used to describe this inconceivably complex, abstract dimension. The protagonists of these paintings are the symbolically charged fusion of the bull, the bestial embodiment of the market, with the rider, the archetype of the heroic, pioneering cowboy, vainly attempting to tame the beast. The exhibition will be accompanied by a publication featuring an essay by Dr Satish Padiyar. Cheung completed an MA in painting at the Royal College of Art in 2001. He was commissioned for a Laing Art Solo award in 2007, and in 2010 had a solo museum show at the Arizona State University Art Museum. 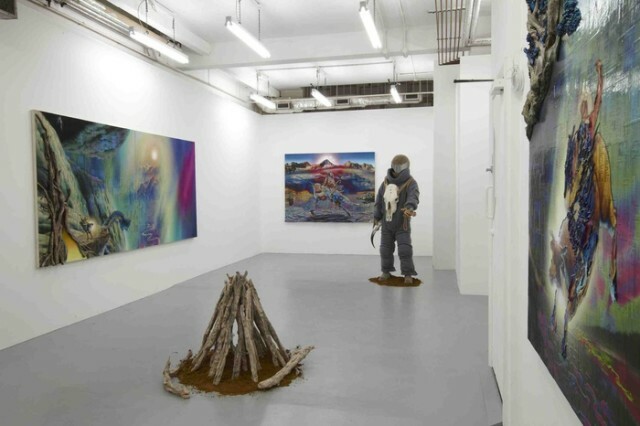 recent solo exhibitions were held at Alan Cristea Gallery, London, 2011, Other Gallery, Shanghai, 2007, Jack Shainman Gallery, New York, 2009, and the New Art Gallery Walsall, 2009. Cheung's works are included in major international private and public collections including the Hirshhorn Museum, the Whitworth Museum, ASU Art Museum, The New Art Gallery Walsall, Hiscox collection and the UBS collection.